Today we completed the exposure of all the three skeletons of the children found in the south-eastern portion of the area. 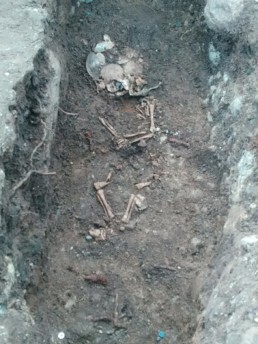 All the skeletons (USK 5087, 5092 and 5094) are oriented W-E and are buried supine inside a small wooden coffin, or a wooden box, now decomposed, of which they are preserved only some nails and some pieces of wood. Around the skull of each infant and on the body we found also some bronze pins for the closure of a shroud or a veil in which the body has been wrapped. USK 5087 is the northern of the three and is bad preserved. It remains only some fragments of the cranium, like the sphenoid and the acoustic meatus. USK 5092 and USK 5094, good preserved, are newborn or perinatal individuals and they seem to be almost the same age. USK 5092 is laying on his back, with the face looking up, the upper limbs slightly flexed on the pelvis and the lower limbs slightly flexed, with the knees open. USK 5094 has the cranium on the left side, the arms slightly flexed on the abdomen and the legs turned to the right. Next week we will document, photograph and remove the bones.